Pet fountains encourage your pet to drink more water, especially cats. Flowing water attracts animals and pet fountains are no exceptions. However, just like your cat’s or dog’s food bowl, pet fountains can get dirty over time. Today, we will talk about the cleaning process of your kitty fountain and what should you pay attention to. 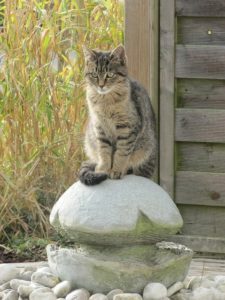 1 Why Should You Clean Your Pet’s Fountain? Why Should You Clean Your Pet’s Fountain? Just like any other complex product in your home, your pet’s fountain can develop problems. Lucky for you, those problems are easily repairable with just a little maintenance. So, what causes those problems? Broken pump – make sure that there is always water in your pet fountain because the pump can easily overheat when there is no water. If you don’t clean the fountain n regular basis, debris and pet hair can clog the pump and render it un-functional. The fountain is loud – there is probably not enough water in the fountain. Fill up your fountain and make sure that there is no debris stuck in the pump. Debris in the fountain – if you see black particles in the bowl, don’t worry. Those particles are carbon dust which can be found in the fountain’s filter. Just clean it up and run the filter through a cold water before you put it back in. Slimy feeling – if the bowl feels all slimy on touch that means that is covered in your pet’s saliva. Wash the bowl and make sure that you change the water more frequently. Especially if you have more than one pet. Leaking fountain – make sure that the rubber cap is tightly in place. That cap keeps the water away from the electrical part of the fountain. You will need a couple of things before you get to a part where you take apart the fountain. There are some household items which can help you with getting rid of the hard stains in the bowl, but we will talk about that later. You can go to the pet store and get yourself a small bristled brush and plastic mesh scrubber which are used for cleaning aquariums. The first thing you need to do is to disassemble the fountain. That process is not complicated, and you can get it done in the only couple of minutes. The first thing you need to do is to pour out any remaining water, remove the housing so you can access the pump and the filter, take out the pump and remove it. NOTE: Check your fountain’s manual to get more detailed instructions on how to disassemble your pet fountain properly. If you have noticed that there are some hard spots left by water in your pet’s plastic water fountain, you can easily get rid of them with a little bit of salt. Empty the bowl but keep it wet. Sprinkle some salt over it, especially over the stain spots. Take a plastic mesh scrubber and scrub the salt over the stained spots until you get a paste-like substance. Keep on rubbing for a couple of minutes and after that just rinse it with warm water, and that should take care of the hard stains in a plastic pet fountain. Stainless steel can get scratched over time, and those scratches always get filled by hard deposits left by water, and it is almost impossible to get them out. However, there is one thing you can do to restore that beautiful shine to your pet’s steel water fountain. To do that, you will need some cleaning agent with acid. You can use lemon juice or vinegar. Take some lemon or grapefruit peels and place them in a jar along with lemon juice or vinegar. Wait for two weeks and after that apply it to the bowl and scrub with mesh scrubber. This should take care of those pesky scratches. Ceramic fountain bowl can easily get scratched if it gets in contact with abrasive substances or harsh powders. That can leave ugly thin cracks that will eventually get filled with mineral deposits. You can use distilled white vinegar for the hard spots and stains and leave it to soak for minimum ten minutes. After that, apply the white vinegar for the second time, only this time, add some baking soda over the hard spots and vinegar. You will notice it fizzes and bubbles, but don’t worry, it just means that it works. After that, gently scrub the ceramic with plastic mesh and rinse with warm water. You can take old toothbrush to scrub the hard-to-reach parts of the fountain, make sure that you take out the filter before applying any cleaning agent, you can use filtered water for a fountain if you have a hard water in your home, and make sure that you clean your pet’s fountain frequently enough so that they can have fresh and clean water anytime they get thirsty. 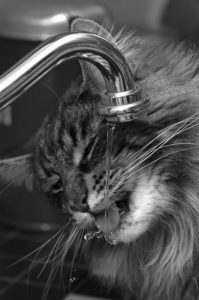 It is extremely important that your pets have access to fresh and clean water every day. Standard bowls can easily get dirty, water warms faster, and it gets stale much quicker compared to pet fountains. However, buying a pet fountain and filling it with water isn’t enough. Make sure that you clean your pet’s fountain frequently and thoroughly. After all, what’s the point of having a pet fountain if your pet won’t drink from it?